For other ships of the same name, see HMS Quorn. 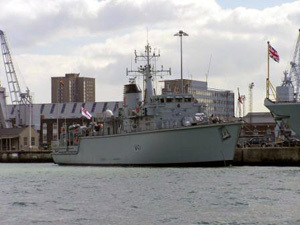 HMS Quorn (M41), the third ship of this name, is a Hunt-class minesweeper of the Royal Navy. She was launched on 23 January 1988, the last ship of her class. On Sunday 18 March 2007, she was presented with the Freedom of the Borough scroll in Melton Mowbray, Leicestershire. Hunt Class vessels are the largest vessels built in Glass Reinforced Plastic for the Royal Navy. 26-28 August 2010: Quron is the Guard Ship for the Port of Dartmouth Royal Regatta 2010. She arrived just after mid day on 26th August, heading up river to Sandquay to take on provisions, before returning to the centre of the port to take up her formal position. This page was last edited on 26 August 2010, at 22:07.